In 1609, Caravaggio returned to Naples from Palmero where he spent several months recovering from a fight in which he had been injured and waiting for the Pope to issue him a pardon so he could return to Rome. 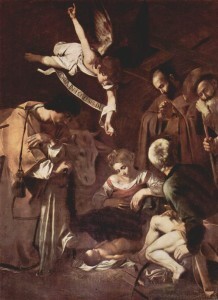 It is believed that it was here that Caravaggio created his large altarpiece, Nativity with St. Francis and St. Lawrence. The painting depicts the infant Christ child on a pile of hay while a weary Mary looks on with an angel overhead and surrounded by men, one of whom we assume to be Joseph. One of the other men is St. Francis of Assisi standing behind the family in his brown Franciscan rob with hands folded. The other figure, in gold colored deaconate garb is St. Lawrence. Though these men were born many years following the birth of the Christ child, the painting was commissioned by the Company of St. Francis who was in charge of the Oratory of St. Lawrence in Palermo. They wanted a scene created which people could relate to and which connected their apostolate to the holy family. The scene Caravaggio created is not the idealic one most might imagine of the first Christmas morn, but instead a sort of glimpse into a more realistic scene to which the viewer can relate. The holy family seems very human and gives a glimpse into the poor and somber life of the day. The cast of characters forms a half circle allowing room for the viewer to be a part of the scene. The painting hung in the Oratory of San Lorenzo in Palermo, Italy for over 350 years. However, on October 18, 1969 Caravaggio’s painting was cut from the frame and stolen. The painting is now on the FBI’s Top 10 Unsolved Art Crimes list. Over the years, numerous rumors have surrounding the theft most of which involve the Mafia. It is possible that the painting, worth an estimated $20 million, may have been destroyed or sold. Whether, destroyed or not, officials don’t know but they do believe the painting has never left Italy.